I don't much care for director Tim Burton beyond a handful of films (PEE WEE'S BIG ADVENTURE and BEETLEJUICE are undeniable classics, and the guy has maybe one or two others that are passable but by no means favorites), so perhaps I'm not the right person to be reviewing the auteur's latest, MISS PEREGRINE'S HOME FOR PECULIAR CHILDREN. But nobody else at the Movie Blog wanted the gig, and I took my five-year-old to see it, so I guess it falls on me. The plot is set in motion when teenage Jake (Asa Butterfield) is traumatized by the mysterious death of his grandfather Abe (Terrence Stamp), whose eyes were plucked from his head. Jake, who discovered Abe's body, is certain there was some kind of monster around, but his parent's assume that's just his way of coping with the tragedy. 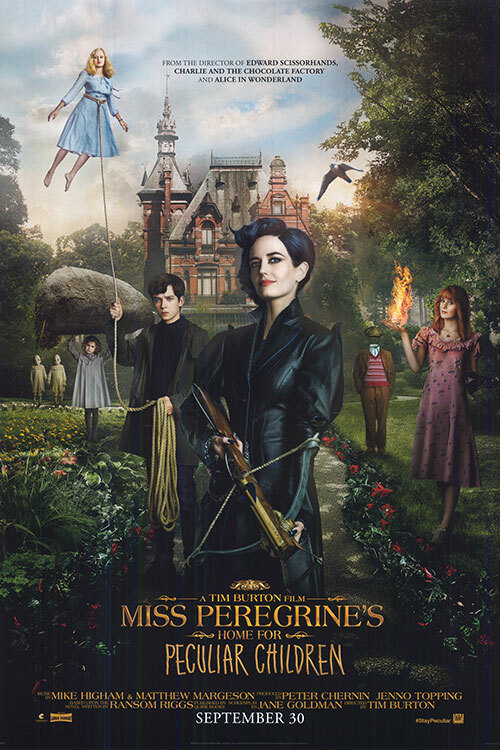 Through fortuitous circumstances, Jake recieves a book that belonged to his grandfather containing a letter from a Miss Peregrine, a character in the stories Abe used to tell Jake that he assumed were made up. Turns out they're true, and the letter sends Jake off on a standard-issue hero's journey tale draped in oh-so-Burton-y trappings. The letter was sent from a Welsh island, and there Jake discovers the titular abode. It's decrepit and abandoned, but before long Jake discovers a hidden entrance that takes him back to the time loop where the home still exists, forever reliving one day in 1943. There he meets Miss Peregrine (Eva Green) and her special students, sort of a goth X-Men. Jake is especially interested in Emma (Ella Purnell), a girl who is lighter than air and has to wear special iron boots so as not to float away. Of course we already know there are bad guys after the specials, and they are led by Mr. Barron (Samuel L. Jackson). They need the eyes of specials to transform some of their friends from monsters into more humanoid form. They also want specials of Miss Peregrine's variety, who have the ability to manipulate time, for some nefarious immortality scheme. The motivations feel pretty silly and contrived, but then, that's usually the case with supervillains, isn't it? Since the movie first came out about a week ago, the issue of the very white casting has been brought up by many. The only black actor in the movie is Jackson, playing a monstrous, subhuman villain. Burton made things even worse with his awkward defense. That will likely be an issue to some, and not a completely insignificant one. More to the point for this reviewer, though, is that the film just isn't very good. This is Burton in soulless mode. He's not emotionally invested in what's happening on screen, so why should we be? But hey, some of the visuals are cool and macabre, so his usual fans should be satisfied. It's just lazy filmmaking, and I sincerely hope it tanks so that we don't get stuck with another one of these things a year or two down the road. 2 out of 4 stars.